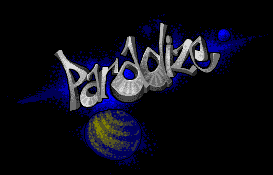 Here you can find and download a few tools and utilities made by Paradize. The Atari ST Harddisk Menu is an AUTO folder menu like a compact disk for harddisk use on the Atari ST/STE/TT and Falcon range of computers. It displays program entries from a .CSV database to allow running of games and demos from the harddisk without having to double click on the desktop. It allows to prepare tables with color data. It helps with calculating smooth color gradients for the STE palette to used with Timer B raster effects. A small utility to display and convert 320x200 pixel 8bit uncompressed BMP pictures into DEGAS PI1 on Atari ST/TT/Falcon. Pictures are displayed using a 16color greyscale palette and ordered dithering. Example BMP files are included! A small utility to view PI1/PC1 and NEO pictures on Atari ST/TT/Falcon. Supports command line and drag'n'drop from modern desktops. A small GEM utility to set the Falcon audio volume to 3 different settings. Updated version from February 11th 2013 now includes AUTO folder versions which allow to select one of the volume levels without interaction. Handy if you don't have a CPX loaded or for a clean boot. Some small AUTO folder utilities and a desk accessory for controlling video frequency on your ST with color monitor. The Paradize Antivirus is a small bootblock to do virus protection on your floppy disks. It comes as a small installer program. Just run the program, insert the disk to be protected into drive A: and press w to write the bootblock into the bootsector. WARNING: DO NOT USE THIS BOOTBLOCK ON (COMMERCIAL) SELFBOOTING DISKS. YOU WON'T BE ABLE TO USE THEM ANYMORE! The Desktop Configurator allows you to select a desktop configuration file at boot time. This small utility which allows you to select one of up to 10 individual DESKTOP.INF (or NEWDESK.INF) files from the AUTO folder. The Cookie Jar Inspector allows you to view all installed TOS cookies in HEX notation. 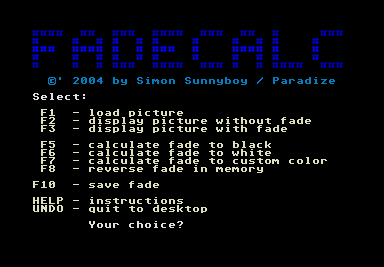 The Fade Calculator allows you to precalculate picture fading effects, saving you from reinventing the wheel with your own fading routine.